Hailey Modin, an entrepreneurship senior from Sumner, Wash., has served Washington State University for more than three years as a peer mentor with the Center for Civic Engagement. 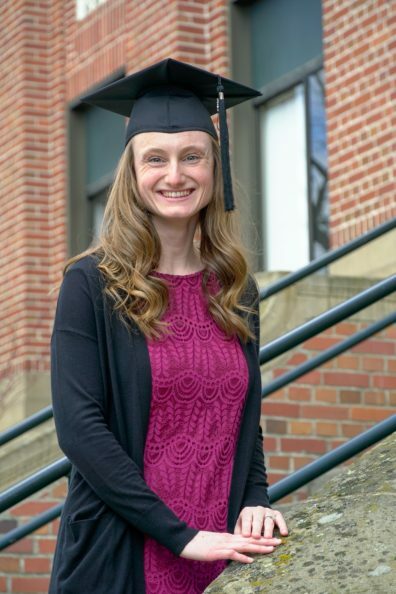 Her exemplary efforts to benefit students and staff, and her support of the Pullman and nearby communities, has earned her the distinction of being selected as WSU Student Employee of the Year for 2018-19. Modin’s role at CCE drastically changed when the office became short-staffed and she found herself filling the role of project leader. This required extra time and additional training as Modin was responsible for transporting students off campus and out into the community for various CCE activities. Thanks to Modin, the CCE was able to make weekly trips to take WSU students to help at the Colfax Food Pantry about 15 miles northwest of Pullman. She also helped transport them to the local Sunnyside Elementary School where they worked one-to-one with second-grade participants in a writing program called Pen Friends. Her efforts further strengthened the ties WSU students have with the region and its residents. In her new expanded role, Modin also made presentations to student groups to explain the benefits of community service. “She delivers information in a way that is very understandable and shows her confidence as a presenter,” said Jessica Perone, CCE faculty consultant. The two worked together connecting service learning courses with the CCE and supporting student’s community engagement. Perone joined the CCE team after Modin. Her contributions made trainings at the CCE rich and well received among her coworkers. “Hailey really has brought the student perspective to the CCE, especially in ways that support our student staff members’ professional development,” Calabretta said. Modin has excelled at connecting the staff and student populations, and attributes it to the nurturing environment at the CCE where she herself was able to grow professionally. “I had a lot of direct mentoring in terms of professional development,” said Hailey, who received feedback on everything from her presentations to how to communicate professionally to different audiences. “It was a lot of super-important little things that turned out to be big things in the professional world,” Modin said. CCE Director Melanie Brown said that Modin took on new projects with intention and enthusiasm and her competency allowed her to further her professional reach. Modin graduates this May before moving to Charlotte, North Carolina, where she will teach middle school math as part of Teach for America. She will also pursue her master’s degree in mid-grade mathematics at the University of North Carolina, Charlotte. All while helping her husband, Daniel, start his business, Modin Brother’s Composites. Hailey will leave the CCE a better place than she found it, added Brown. “It is hard to imagine what the department will be like without her presence,” Calabretta said. What is Student Employee of the Year? The Student Employee of the Year is a recognition program created for outstanding student employees working for Washington State University. Once per year, supervisors from various on-campus departments can nominate current student employees to be the recipient of the Student Employee of the Year award. The Student Employee of the Year will be recognized through various campus functions. Who can participate in the Student Employee of the Year Recognition Program? Supervisors from any WSU campus can nominate a student employee at any degree level. Students must be currently enrolled at WSU and have been employed for at least six months to be considered for the award. Student employees must be earning their paycheck from WSU, and outside organizations are not invited to participate. How many student employees can an employer nominate? On-campus supervisors can nominate a maximum of two student employees per functional area of a WSU on-campus department. (For example- University Recreation could nominate two Membership Attendants, two Service Attendants, two Weight Room Attendants, two Custodians, etc).